Picture is for reference only and may contain options or accessories that are not included. 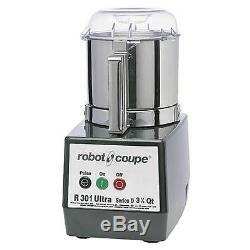 Robot Coupe R301 ULTRA B Food Processor with 3.5 Quart Stainless Steel Bowl. Efficient, robust, and fast, the Robot Coupe R301 ULTRA B Food Processor is a reliable and time-saving investment. Effortlessly performing even the lengthiest tasks in mere minutes, this bowl cutter mixer consistently produces a flawless end product. It is ideal for grinding, mincing, and kneading, as well as for making mousses, emulsions, and smooth stuffings. Output power: 1.5 HP. Electrical Data: 120/60/1, 12 amps. Dimensions: 8-1/2" W x 11-15/16" D x 15-11/16 H. Direct drive induction motor (no belt) for intensive use. Motor base made from heavy-duty composite material. Magnetic safety system, thermal failsafe, and motor brake. Pulse button for better cut precision. 3.5-quart stainless steel cutter bowl with handle for better grip. Bowl-base high resistance smooth blade assembly for homogeneous processing even for small amounts. Central lid opening for adding liquid or solid ingredients during processing. High heat- and shock-resistant see-through lid to monitor processing from start to finish. All parts are dishwasher-safe and can easily be removed for cleaning. Cutter attachment: lid, bowl, and high resistance stainless steel smooth blade assembly with removable cap. Most warranties are not valid if used at a non-commercial address. WARNING: This product may contain chemicals which are known to the state of California to cause cancer, birth defects or other reproductive harm. These items are delivered to your locations via a tractor trailer. You are responsible for offloading the merchandise and bringing your merchandise inside of your location. A lift-gate is a device used to raise and lower items from ground level to the level of a tractor trailer. These trailers are designed to load and unload at a loading dock or with a fork-lift. Usually this is a home, but it could be a church, farm community center, etc. Businesses run from a home are still considered residential. When you receive the item and sign for it, you own it. This is the only way you will be compensated for the damage! Inspect the outside of the packaging to look for dents or crushed corners. If you see anything even slightly suspicious carefully remove all packaging and inspect the item. The driver may be impatient but that beats having to settle for a damaged item. What if my item is damaged? This is often the best option if you need to get your item operational and the damage is cosmetic. If accepted, prior authorization must be obtained to return any equipment. Refurbishing, if necessary, will be an additional charge to purchaser and will be deducted from any authorized credit. The item "Robot Coupe R301 Ultra B Food Processor with 3.5 Quart Stainless Steel Bowl" is in sale since Thursday, October 13, 2016. This item is in the category "Business & Industrial\Restaurant & Food Service\Commercial Kitchen Equipment\Food Preparation Equipment\Food Processors". The seller is "dougequip" and is located in Bluefield, West Virginia.